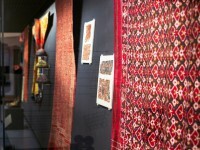 There are a number of circular embroideries in the collection and some, like this one, have been fashioned from another textile. This design of a palmette nestling within a larger palmette, worked in split stitch in three colours, has been chosen to decorate a roundel. Because it is so worn we cannot be sure whether it was made as a cover for a jar but this is its most likely function. 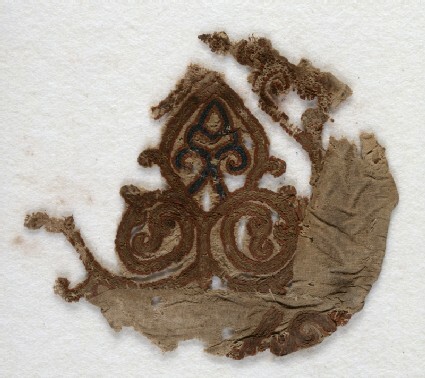 Its place of origin is equally difficult to determine but it is different from the various types of embroidery from Egypt and is so similar in colouring and technique to fragment No.11 [EA1984.264] that it was possibly made in Seljuk Anatolia or Syria. A yellow palmette with curving tendrils contains a smaller blue palmette, both with red outlines. The embroidery is sewn onto a second linen fragment with additional, similar embroidery (fragmentary), shaped into a roundel with a curved hem.